For the navigational aid displayed to airline passengers, see In-flight entertainment. 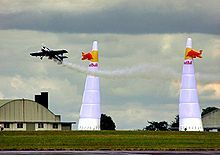 The largest air show measured by number of exhibitors and size of exhibit space is Le Bourget followed by Farnborough, while Dubai air show and Singapore Air Show are both claiming the third place. The largest air show or fly-in by number of participating airplanes is EAA AirVenture Oshkosh, commonly known as "Oshkosh" after its location in Wisconsin, with approximately 10,000 airplanes participating each year. The biggest military airshow in the world is the Royal International Air Tattoo, at RAF Fairford in England. Air "seasons" vary around the world. The United States enjoys a long season that generally runs from March to November, covering the spring, summer, and fall seasons. Other countries often have much shorter seasons. In Japan air shows are generally events held at Japan Self-Defense Forces bases regularly throughout the year. The European season usually starts in late April or Early May and is usually over by mid October. The Middle East, Australia and New Zealand hold their events between January and March. However, for many acts, the "off-season" does not mean a period of inactivity; pilots and performers use this time for maintenance and practice. The type of displays seen at an are constrained by a number of factors, including the weather and visibility. Most aviation authorities now publish rules and guidance on minimum display heights and criteria for differing conditions. In addition to the weather, pilots and organizers must also consider local airspace restrictions. Most exhibitors will plan "full," "rolling" and "flat" display for varying weather and airspace conditions. The types of shows vary greatly. Some are large scale military events with large flying displays and ground exhibitions while others held at small local airstrips can often feature just one or two hours of flying with just a few stalls on the ground. Air Displays can be held during day or night with the latter becoming increasingly popular. Shows don't always take place over airfields; some have been held over the grounds of stately homes or castles and over the sea at coastal resorts. The first public international airshow, at which many types of aircraft were displayed and flown, was the Grande Semaine d'Aviation de la Champagne, which was held Aug. 22-29, 1909 in Reims. This had been preceded by what may have been the first ever gathering of enthusiasts, June 28-July 19 of the same year at the airfield at La Brayelle, near Douai. Before the Second World War, air shows were associated with long distance air races, often lasting many days and covering thousands of miles. While the Reno Air Races keep this tradition alive, most air shows today primarily feature a series of aerial demos of short duration. 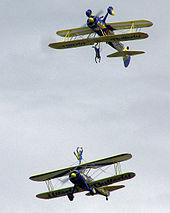 Most air shows feature warbirds, aerobatics, and demonstrations of modern military aircraft, and many air shows offer a variety of other aeronautical attractions as well, such as wing-walking, radio-controlled aircraft, water/slurry drops from firefighting aircraft, simulated helicopter rescues and sky diving. Specialist aerobatic aircraft have powerful piston engines, light weight and big control surfaces, making them capable of very high roll rates and accelerations. A skilled pilot will be able to climb vertically, perform very tight turns, tumble his aircraft end-over-end and perform manoeuvres during loops. Larger airshows can be headlined by military jet demonstration teams. In the United States, those are the U.S. Navy Blue Angels and USAF Thunderbirds. The Canadian Forces Snowbirds will headline many airshows in Canada and the United States. Many airshows in the United Kingdom are headlined by the RAF's Red Arrows. Solo military jet demos, also known as tactical demo, feature one aircraft, usually a strike fighter or an advanced trainer. The demonstration focuses on the capabilities of modern aircraft used in combat operations. The display will usually demonstrate the aircraft's very short (and often very loud) rolls, fast speeds, slow approach speeds, as well as their ability to quickly make tight turns, to climb quickly, and their ability to be precisely controlled at a large range of speeds. Manoeuvres include aileron rolls, barrel rolls, hesitation rolls, Cuban-8s, tight turns, high-alpha flight, a high-speed pass, double Immelmans, and touch-and-gos. Tactical demos may include simulated bomb drops, sometimes with pyrotechnics on the ground for effect. Aircraft with special characteristics that give them unique capabilities will often display those in their demos; For example, Russian fighters with Thrust vectoring may be used to perform Pugachev's Cobra or the Kulbit, among other difficult manoeuvers that cannot be performed by other aircraft. Similarly, an F-22 pilot may hover his jet in the air with the nose pointed straight up, a Harrier or Osprey pilot may perform a vertical landing or vertical takeoff, and so on. Mountain Home Air Force Base, Idaho, September 14, 2003: U.S. Air Force Thunderbirds Captain Christopher Stricklin ejecting from his F-16 after realizing he could not pull up in time from a Split-S and ensuring the aircraft would not crash into spectators. The aircraft was destroyed less than a second later with no loss of life. Air shows may present some risk to spectators and aviators. Accidents have occurred, sometimes with a large loss of life, such as the 1988 disaster at Ramstein Air Base (70 deaths) in Germany and the 2002 air show crash at Sknyliv (77 deaths), Ukraine. Because of these accidents, the various aviation authorities around the world have set rules and guidance for those running and participating in air displays. For example, after the breakup of an aircraft at 1952 Farnborough air show (31 deaths), the separation between display and spectators was increased. Air displays are often monitored by aviation authorities to ensure safe procedures. In the United Kingdom, local authorities will first need to approve any application for an event to which the public is admitted. No approval, no event. The first priority must be to arrange insurance cover and details can be obtained from your local authority. An added complication is a whole new raft of legislation concerning Health & Safety in particular Corporate Manslaughter, which can involve the event organiser being charged with a criminal offence if any of the insurances and risk assessments are not fully completed well in advance of the event. If this very basic step isn't completed then any further activity should be halted until it is. Rules govern the distance from the crowds that aircraft must fly. These vary according to the rating of the pilot/crew, the type of aircraft and the way the aircraft is being flown. For instance, slower lighter aircraft are usually allowed closer and lower to the crowd than larger, faster types. Also, a fighter jet flying straight and level will be able to do so closer to the crowd and lower than if it were performing a roll or a loop. Pilots can get authorizations for differing types of displays (i.e. limbo flying, basic aerobatics to unlimited aerobatics) and to differing minimum base heights above the ground. To gain such authorizations, the pilots will have to demonstrate to an examiner that they can perform to those limits without endangering themselves, ground crew or spectators. Despite display rules and guidances, accidents have continued to happen. However, air show accidents are rare and where there is proper supervision air shows have impressive safety records. Each year, organizations such as International Council of Air Shows and European Airshow Council meet and discuss various subjects including air show safety where accidents are discussed and lessons learned. ^ Peter Shaw-Smith (November 8, 2017). "2017 Dubai Airshow Expected To Be Largest Yet". AIN. ^ "On This Day – 1952: Dozens die in air show tragedy". BBC News. 2008. Retrieved 10 February 2018. ^ Desk, BWW News. "Cleveland National Air Show Awarded Prestigious Pinnacle Award". broadwayworld.com. Retrieved 23 March 2018. Wikimedia Commons has media related to Air shows.